Once you’ve assigned a particular function to a part of a finger, all you need to do is tap the device with that region of the finger to trigger an action. Screen-based interfaces are so 2015. We’re now interacting with gadgets in ways that are a lot more versatile. Tap Strap, for example, makes anything a keyboard, so you can use it to type into any Bluetooth-compatible device. Hayo lets you puts controls for TVs, music systems, and whatever else anywhere in a room (really, anywhere). 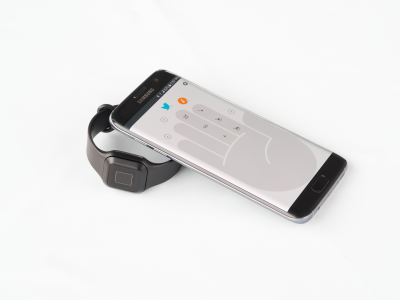 Tapdo, which made a big splash at the Mobile World Congress earlier this year, turns the very things using which you provide input – your fingers – into controls for your devices. Tapdo is a single physical button that you can wear in a wristband or clip onto wherever it’s easiest to access. A fingerprint scanner is built into Tapdo’s diminutive body. It scans not just the tips of your fingers, but also different parts of it since they all have unique signatures. Each part of a finger that you scan into it is like adding another button to which you can assign a function. Additionally, different orientations of the same fingerprint can be assigned a different function. Once you’ve assigned a particular function to a part of a finger, all you need to do is tap the device with that region of the finger to trigger the action. Tapdo works in tandem with a smartphone app. Within the app, you can choose which finger to connect to which app. Then you scan one part of the finger using the device. Finally, you assign an action to that part of the finger. The app displays what each of your fingers and their parts does in case you ever forget (which you probably will). What can Tapdo do? A whole bunch of things. Among the features that are already implemented is integration with Philips Hue, so anyone part of that ecosystem can use Tapdo to control smart home devices. You can also use it to navigate open-source media player Kodi, set alarms, or Tweet your current location. There are a bunch of cool features in the pipeline. By the delivery date, the team plans on delivering IFTTT integration, the ability to navigate Spotify, accept phone calls, and take photos among other things. By the end of 2017, you’ll be able to order pizza, book a taxi, and identify songs using Shazam with Tapdo. You can even submit your own ideas for features on the Tapdo website. Tapdo has raised $24,000 on Kickstarter so far with contributions from over 200 backers. The campaign needs to amass $48,000 in about a month for the project to get funded. A Tapdo button and wristband combo is priced $115 on Kickstarter. That’s 16% or $23 off the $138 retail price. Tapdo ships to anywhere in the world and deliveries are expected to commence September 2017.